New Tick original cover art from Ian Chase Nichols! Hello, all! How was everyone's Free Comic Book Day? I was once again able to travel to Boston for the event and I had a great time. I'm glad to see that the new Tick issue is getting some positive reviews and it seems that most people were able to grab a copy if they wanted one. I walked away with a big stack of books and, surprisingly enough, some original art from an upcoming issue! The image you see above is what will soon become the cover to this year's convention issue. The issue will first debut at the San Diego Comic-Con with a different cover, and will be offered with the above cover for the 2016 Boston Comic Con. 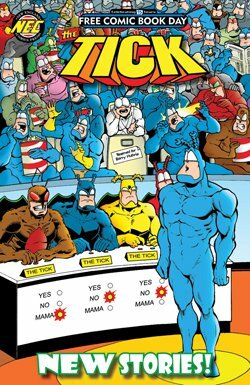 ...and wouldn't you know, at the top, tumbling backwards out of the boat is none other than Roger, the Tick's maybe-one-time sidekick, who first appeared in the 2015 FCBD issue! Ah, Roger, we hardly knew ya. I'm obviously thrilled to have this new page of art to add to the collection. Look for the book itself to show up in the next few months! New Tick comic out on Free Comic Book Day! This Saturday is the 15th annual Free Comic Book Day celebration at comic shops all over the world. Once again, there's a new Tick book coming out. The cover is above, and it's a take on a classic Adventure Comics cover with Superboy and the Legion of Super Heroes! Joining me again on art is Duane Redhead, who has done some really nice work for this issue. 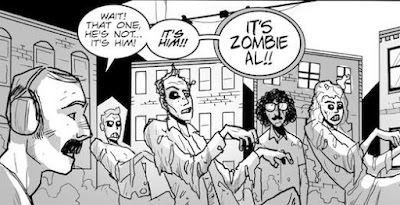 There's also a backup story with art by Ian Nichols that ties into the main story! 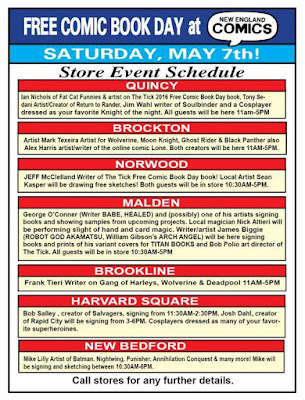 In a few days, I'll be traveling to Boston for the weekend to sign some copies of the new issue with lots of other guests. 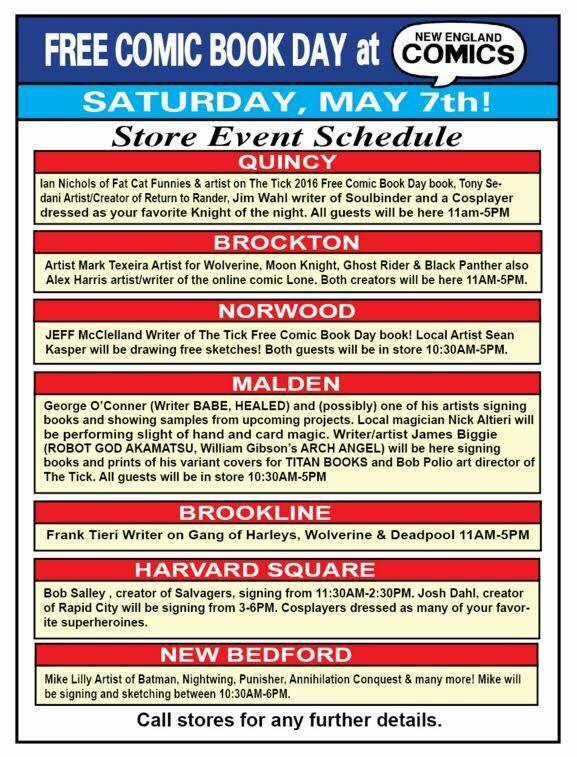 I'll be at New England Comics' Norwood location from 10:30-5:00 on Saturday. These signings are always fun and it's great to see people and explain that I'm not Ben Edlund. If I have the opportunity, I might try and sneak over to another store after my signing is over. If you're in the Boston area, I hope that you'll stop by and pick up a book! In other (very exciting) Tick news, the Amazon Prime pilot will be filming soon! 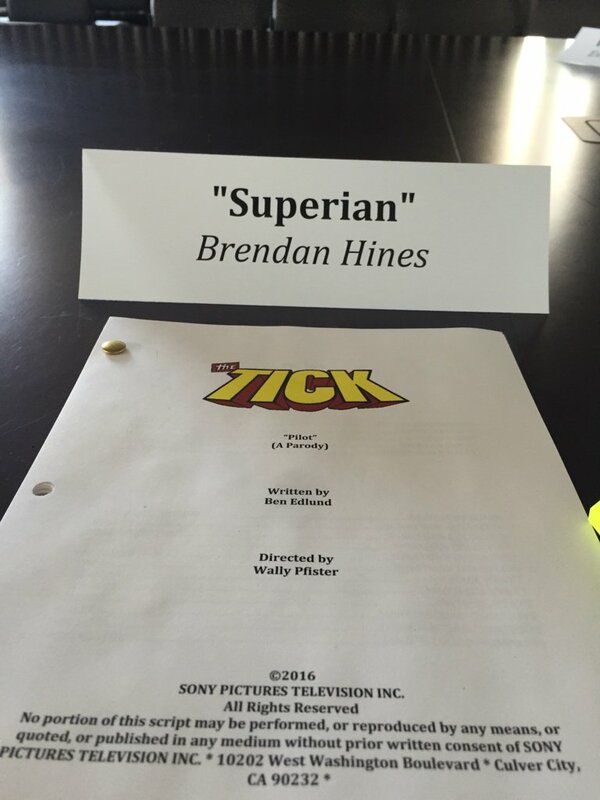 Several of the actors have posted updates online, including this picture of the pilot script from Brendan Hines, who will play the new character Superian! I am obviously thrilled that this is happening. Here's hoping that it moves forward to a full series soon!